We are proud to stock and offer products from a leading selection of manufacturers. The best products on the market, delivered the next day. 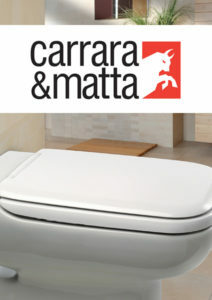 Carrara & Matta has continually been a pioneer in toilet seat design and innovation. From thermoset urea and thermoplastic to compression moulded wood, Carrara & Matta toilet seats are ready to meet any need. Carrara & Matta couples its tradition of sophisticated design with excellent quality to create stylish seats with innovative features and benefits. As a major brand in the Bemis Manufacturing portfolio, Carrara & Matta is a well-respected and popular brand across Europe, especially in the professional channel. View and download our entire range of Carrara & Matta products. Alternatively, for ordering, questions or any further information please contact our Sales Team on 0208 984 1000. Get in touch to see how FW Hipkin can supply and transform your business. We've proudly served independent plumbers merchants since 1890.